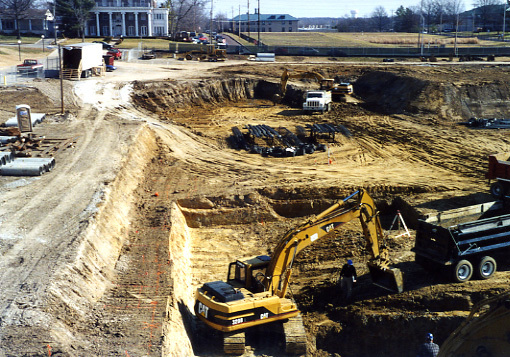 Excavation begins on the construction site for the Life Sciences Center, (2002). The picture looks east across the site. Sanborn Field can be seen in the far background. 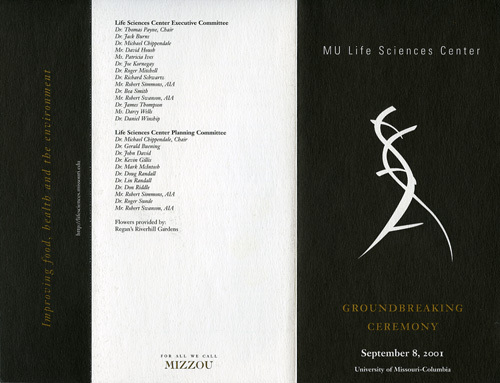 This Record Sub-Group contains administrative and other records created by a number of individuals involved with the conception, design, planning, construction, and administration of the Life Sciences Center at the University of Missouri. Foremost among these individuals was G. Michael Chippendale, a faculty member in the Department of Entomology at the University of Missouri since 1968, who served the Center in various capacities over many years, including as its Interim Director. Many of the records were kept as "day files" by Chippendale. Chippendale augmented his own records by those of others involved in the development of the Center, including Bruce Bullock, Jerry Clevenger, Linda Franz, Larry Knipp, Steve Knorr, Roger Mitchell, William Pfander, Ken Schneeberger, Linda Sowers, and Darcy Wells.The records consist largely of correspondence and memoranda but also include committee files, notes, reports, transparencies, presentations, supplemental documents, architectural plans, printed and duplicated material, photographic prints, and a few VHS video tapes. Historical Note: As early as 1982, there were calls in the College of Agriculture for a separate campus building dedicated to research, teaching, and outreach in Plant Sciences to parallel the functioning of the existing Animal Sciences Research Center. Less than a decade later, Roger Mitchell, Dean of the College of Agriculture, Food and Natural Resources (CAFNR), formed a committee to pursue the idea of a Plant Biotechnology Building. In 1992, a space study for the Plant Sciences Building was commissioned from Paulien & Associates, and two years later a committee that included G. Michael Chippendale as its convener was charged by the Deans of CAFNR, the School of Medicine, the College of Arts and Science, and the College of Veterinary Medicine with developing a program statement and business plan for a Biosciences Research Center. As a result, in 1995, a plan for a $70 million dollar project was crafted for a Center for Genetic Technologies. In 1997, support from MU Chancellor Richard Wallace for a much-needed interdisciplinary research center led to a new, two-phase construction plan for the Life Sciences Center which now included the College of Engineering and the School of Human Environmental Sciences as participants. By the end of 1998, an Executive Committee led by Dean of CAFNR Tom Payne and a Building Committee (later renamed Planning Committee) led by Chippendale were in place and working toward making the Life Science Center a reality. Ground was broken in 2001, the topping-off ceremony occurred in 2003, and the building was dedicated in September of 2004. Subsequently, the Center was named in honor of Missouri Senator Christopher "Kit" Bond, who helped secure substantial federal funding for the building. This Record Sub-Group is divided by record type and topic into eight series derived in part from the original filing system. Series Eight is based on format alone and its types and topics overlap with those found in Series One through Seven. Correspondence does not have its own Series; rather that record type is found throughout the various Series in this Sub-Group. Series One contains general administrative records related to the Life Sciences Center. The Series is subdivided into two Sub-Series with Sub-Series One pertaining to the background of the Life Science Center prior to the feasibilty studies of the mid-1990s and Sub-Series Two pertaining to the administrative aspects of the building and Center from ca. 1996 on. Series Two contains records of the various committees established to oversee the planning, design, construction, and operations of the Life Sciences Center. Series Three contains records related to the development efforts and funding for the Life Sciences Center. Series Four contains records pertaining to the director position of the Life Sciences Center. Series Five contains records of the design and construction of the Life Sciences Center and its facilities. Series Six contains funding and other fiscal records of the Life Sciences Center. Series Seven contains presentations made on behalf of the Life Sciences Center throughout its planning and construction. Series Eight contains electronic records created, received, and maintained by Chippendale that pertain to the planning, construction, and administration of the Life Sciences Center. The records in this Series include email correspondence, meeting agendas and minutes, goals, proposals, lists, policies, and other similar documents. The Series is subdivided into two Sub-Series with Sub-Series One encompassing electronic mail and its attachments and Sub-Series Two containing all other original electronic documents. Note to Researcher: An attempt has been made during the processing of the records in this Sub-Group to eliminate duplicate documents and items without compromising the archival record in terms of provenance, original order, and content. Nevertheless, some non-essential duplication still remains in this Sub-Group, especially in the overlap between paper and electronic records. three years later in September of 2004. FF 7 - For All We Call Mizzou - Life Sciences Center Booklet, n.d.
FF 3 - Development Packet, n.d.
FF 15 - Miscellaneous Plans and Drawings, n.d.
FF 16 - Monsanto Auditorium/Conference Facility, n.d. Note to Researcher: For a promotional DVD-R produced by BNIM Anshen+Allen about the Life Science Center, including footage of the dedication of the Center, see C:1/141/31. Note to Researcher: The number in brackets indicates the number of emails in each directory/folder. Note to Archivist: The records in this Sub-Series come from two sources: the computer hard drive of Chippendale and various 3.5-inch computer diskettes filed among the paper records. There may be some duplication between these electronic records and the paper records. The Sub-Series consists of the following record types and topics: assessments, correspondence, evaluations, meeting minutes, meeting notes, meeting agendas, memoranda, organizational charts, printed and duplicated material, reports, presentations, budget, committees, including the Building Committee, the Executive Committee, the External Advisory Committee, the Facility Planning Committee, the Facility Operations Committee, the Planning Committee, the Research Program Advisory Committee, the Life Sciences Task Force, development, equipment, facilities, faculty, funding, and staff. Restrictions Note: The Archives of the University of Missouri-Columbia is required by law and Board of Curator's policy to restrict access to some files and information. Student records are held as confidential under the Federal Educational Rights and Privacy Act of 1974 and by University policy. Faculty promotion and tenure records and Academic Personnel files are restricted for 75 years, or the lifetime of the individual. All grievance, disciplinary, and medical records are treated as confidential files. Consultations with legal counsel, both in-house and external, are protected by the attorney/client privilege and will not be released.